I feel like I often use the weather to introduce my recipes. It’s kind of standard protocol. It’s fretfully hot? (It’s Not). Popsicles! Or hey! It’s cold! (It is cold, even in California these days, jeez.) We need sweaters. Mugs of tea. And chicken pot pie! It makes sense — warm, rib-sticking fare for chillier weather — but really, weather talk? Has it come to that? We’re all friends here, after all. We can talk about our ups and downs, the joys and heartbreaks and embarrassments of it all. I just read a lovely essay about heartbreak here, actually. Heartbreak comes in many forms, though, as I’m sure you’re aware. 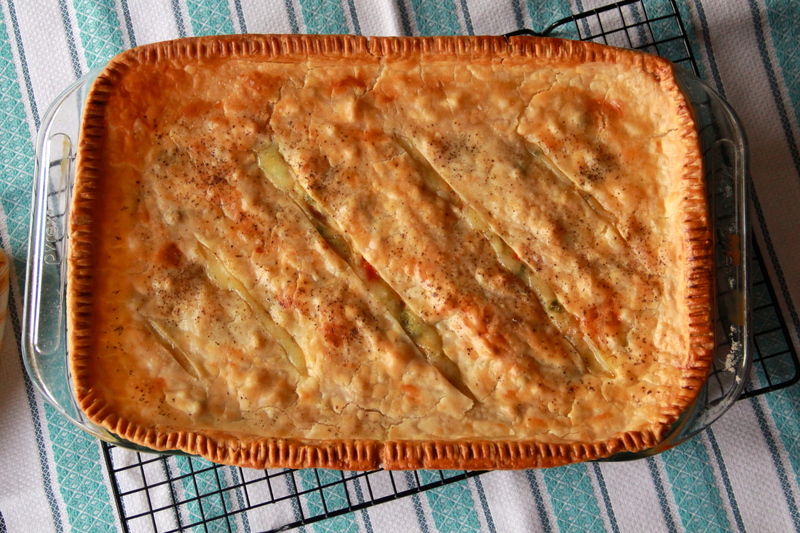 Chicken pot pie can help with heartbreaks. And embarrassments? My life is full of them. I’m really good at tripping in public, over nothing but my own (normal sized, you should know) feet. In college I majored in American Studies but if you asked me who our 5th President was, I’d have to Google it. And the other day while clothes shopping I ran into a girl I went to grade school with — I was half-zipped into a too-small dress and had just popped my head out of the fitting room to ask my sister for help, and oh hey! There she was. Tall and svelte and beautiful, smiling and ready to catch up on 20 lost years of friendship. I thought I should hug her but didn’t want to risk ripping the dress/being naked so instead I just took an awkward half-step forward and stood there, grinning dumbly. She asked me about my life and then I think I asked her if she had checked out the sale section? Awesome. Oh and also, last week I forgot to wear deodorant to a group exercise class. Joys are better. My current joys include going on chilly runs with my dad and sister before eating too much cheesecake. Watching my new niece, Matilda, and hoping she’ll fall asleep on me. Cozying up with cheeseball Christmas movies on abc family. Or nailing a cookbook recipe on the first try! Joy. Chicken pot pie is a joy, especially one that’s homemade but simplified (rotisserie chicken meat and Pillsbury crust, holler). I made this for Matilda’s new parents a few weeks ago, and it was so heartwarmingly good that I made it again the very next day. It makes enough for two medium-sized pans of pot pie, so we ate one and I stashed the other in the freezer, where it will keep for a few months (if it lasts that long), ready to ease the next heartbreak, soothe the inevitable embarrassment, or celebrate the next joy — maybe just a chilly evening with friends and family. Joy to you, friends! And chicken pot pie. I adapted this recipe from my girl Ina Garten. My version does away with the frozen pearl onions (which I can never actually find anyway), and adds a healthy amount of fresh dill, green onions and creamy potatoes. 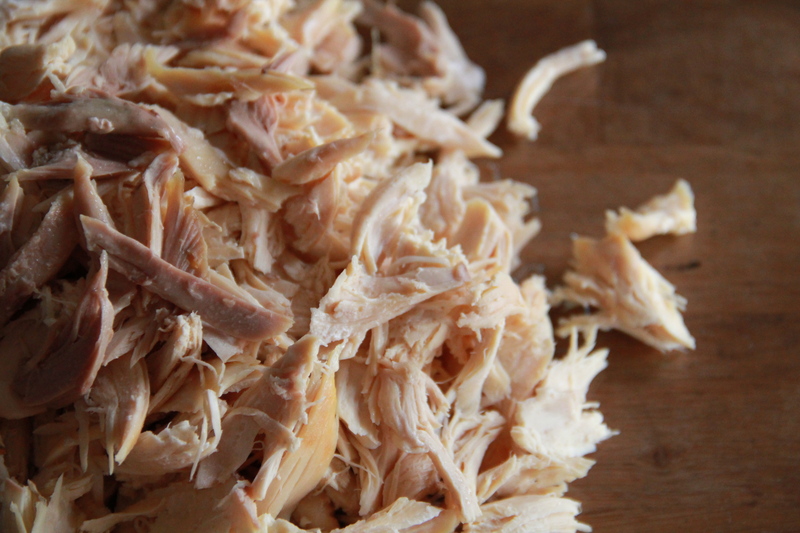 This is a good recipe to have on hand around the holidays, when houses are full and stomachs are empty. If you’re making the crust from scratch, have at it — and let the dough chill in the fridge while you prepare the filling. Heat the oven to 375 degrees F.
In a small sauce pan, heat the stock over medium heat, and whisk in the bouillon cubes until dissolved. In a large dutch oven, melt the butter over medium heat. Add the chopped onions and carrot and saute for about 10 minutes, until onions are translucent. Add the flour and cook, stirring pretty constantly, for 5 minutes more. The mixture will be quite thick. Add the hot stock and stir to combine, simmering for another minute to thicken the sauce before adding the half-and-half. 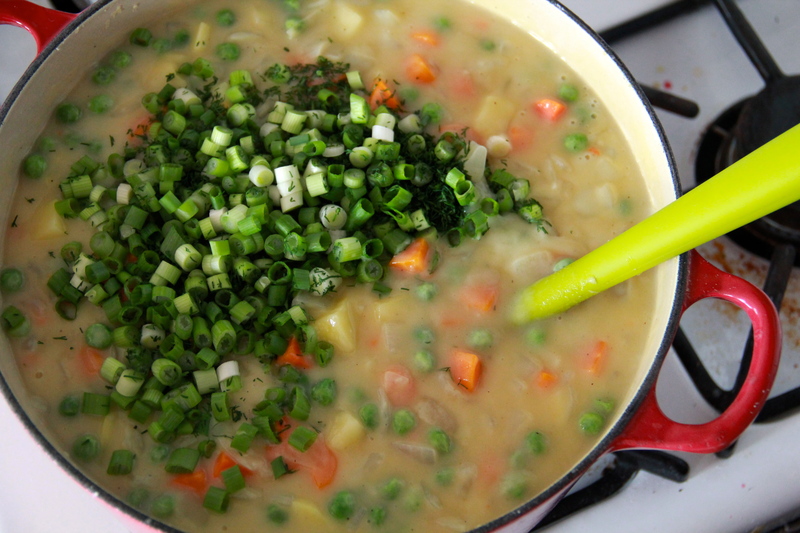 Next add the salt, pepper, potato, green onion, frozen peas, fresh dill and chicken meat, stirring well to combine. Carefully pour the filling into oven-safe baking vessels — there will be enough to fill a 5.5 quart dish, but you can also use a bunch of smaller ramekins, oven-proof bowls or 2 medium size pyrex dishes, if you like. Brush a bit of egg wash around the sides of your baking vessel(s). On a well-floured surface, roll out your crust to 1/4-inch thickness. Cut out circles to place over your ramekins, if using. Carefully place the rolled crust over your baking dish(es), folding and tucking the edges of dough around the filling, and pressing into the egg-washed sides, to stick. 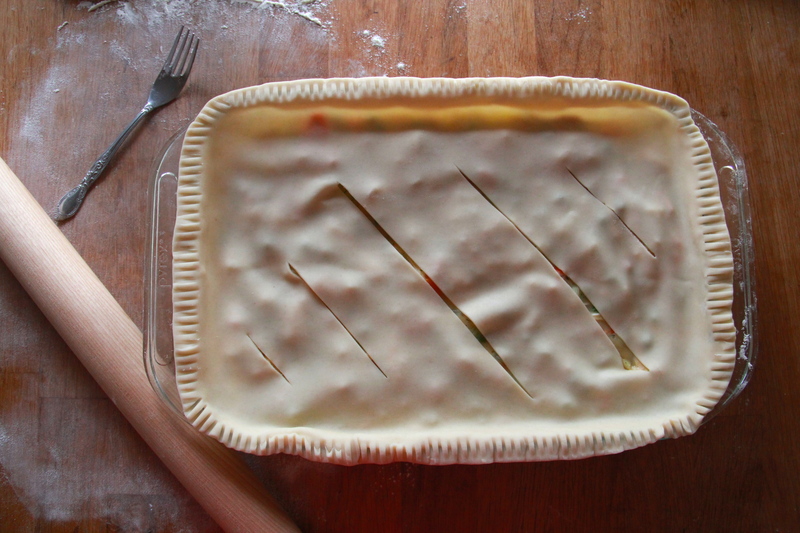 Use the tines of a well-floured fork to press around the edge of the dough to seal. Use a sharp knife to cut a few slits in the top of the crust for ventilation, then brush the pastry evenly with some egg wash. Sprinkle the top with some extra salt and black pepper. 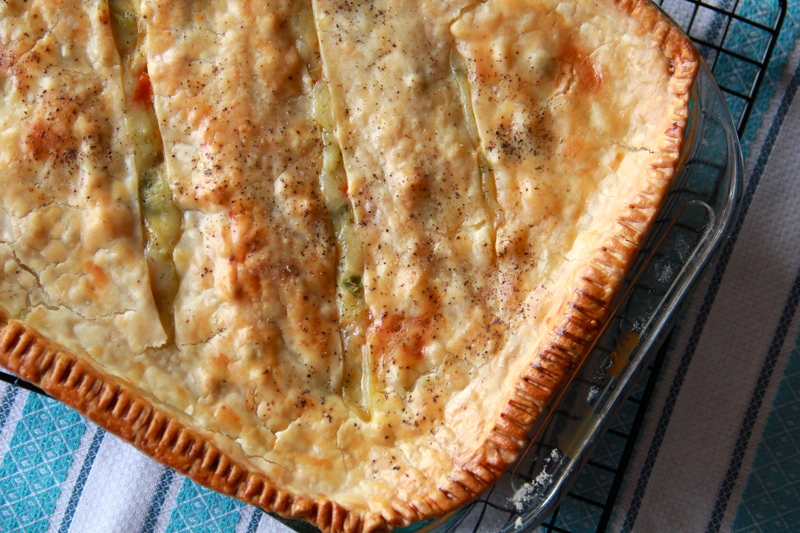 Place your baking dish(es) on a sheet pan (to catch any filling that bubbles over), and bake the chicken pot pie(s) for about an hour, until the crust is deeply golden brown and the filling is bubbly. Allow the pie(s) to cool slightly before serving. Note: If you want to freeze the chicken pot pie for later, do so after you’ve draped the raw pastry crust over the filling. Press the sides of the crust to seal it, cut your ventilation slits, and then wrap the whole thing tightly with plastic wrap, then tin foil, and place the pie in the freezer. It will last for about 3 months. When you’re ready to bake it, just let the frozen pot pie thaw for an hour at room temperature before brushing with egg wash and baking as usual. Pot pie is on my cooking to-do list. This looks great! And I love pate brisee. I love this! Great looking dish. Perfect for a cold winter dinner, will have yo give it a try soon. definitely going to try this! i’ll probably go with store-bought dough. but maybe inspiration will strike and i’ll try it out with homemade. thanks for some wonderful winter cooking inspiration! No shame store-bought dough! Hope you enjoy! No matter what crazy new foods I try, chicken pot pie will always have a top 5 spot. It is so comforting and perfect. I love these short cuts! Yay weeknight pot pie!